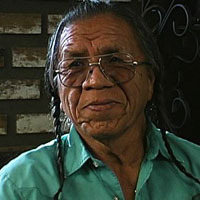 Mr. Adams is a Bitterroot Salish tribal elder and educator who served in the US Navy as a gunner in the Korean Conflict of the 1950s. He is dedicated to preserving Salish language and culture. In his interview, he educates us about the Salish oral tradition and the Salish interpretation of the 1855 Hellgate Treaty. When to tell Coyote Stories - Louis Adams. Removal of the Bitterroot Salish - Louis Adams.